Enterprise Mobility has increasingly become a requirement for organizations across industries. In the epoch of delivery models and global business, the mobility and security functionalities for Bring Your Own Device (BYOD) and consumer-oriented devices presented by WLAN are ideal for enterprises that have large numbers of knowledge workers. Additionally, WLAN tenders the possibility for an organization to be nimble with the ability to adapt quickly to changing business demands. Furthermore, Enterprise WLAN plays a crucial role enabling IoT (Internet of Things). According to the reports, the installed base of IoT devices will grow from 15.4 billion in 2015 to 30.7 billion in 2020, and it will require nearly 1 billion WLAN network devices for connecting to the networks. With enterprise WLANs under constant pressure from growing mobility demands and an influx of new devices, there is a ubiquitous requirement for WLAN solution providers to understand the quandaries, and put together an appealing and comprehensive end-to-end WLAN service offering. 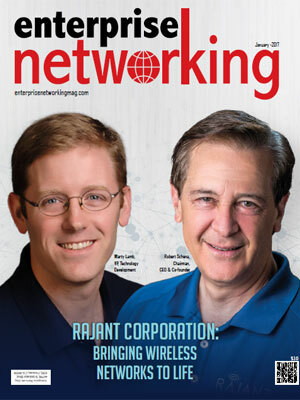 To help CTOs, CIOs, and CEOs to find the right WLAN solution provider, our distinguished selection panel, comprising CEOs, CIOs, VCs, industry analysts and the editorial board of Enterprise Networking has selected the Top 10 WLAN Solution Providers 2017 that exhibit innovative technologies, methodologies and customer service in this space. We present to you Enterprise Networking’s Top 10 WLAN Solution Providers 2017.